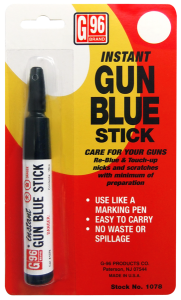 Instant action gun blue pen type dispenser makes it easy to touch up small marks and scratches with a minimum of preparation. Produces a rich dark blue that will not rub off or discolor. Ideal for use on finger guards, barrel tips, etc. For best results, clean with G96 Gun Degreaser and finish with G96 Gun Treatment, G96 Gun Oil or G96 Synthetic CLP Gun Oil. 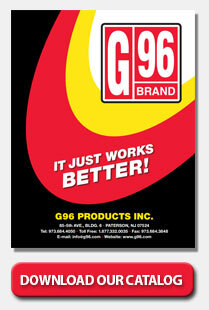 Remove all oil, grease, or dirt from surface to be blued by cleaning with G96 Gun Degreaser. Pitted or rusted surfaces should be sanded lightly with emery cloth or steel wool. Apply a small amount of G96 Gun Blue liquid from the tip of the dispenser. After blueing is achieved (after turning greyish, usually within 15-30 seconds), neutralize area with water. Wipe dry and apply a protective coating of G96 Gun Treatment or G96 Gun oil or G96 Synthetic CLP Gun Oil for a long lasting lustrous finish. Better penetration is achieved if metal is slightly warm. Wash hands after use. To remove cap, push down and turn counter clockwise. To close cap, push down and turn clockwise.